The US Navy’s 2019 shipbuilding plan calls for expanding the fleet to 355 battle force ships. 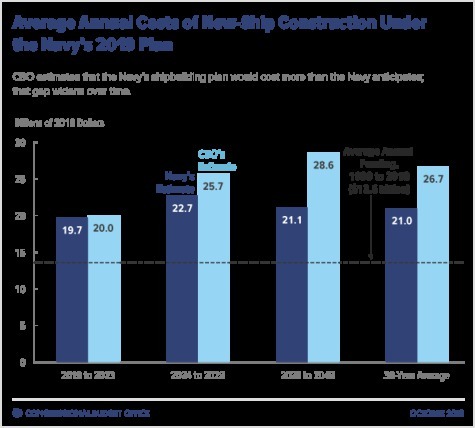 CBO found that, on average, implementing the plan would cost 80 percent more per year than the shipbuilding funding that the Navy has received in recent decades. The Department of Defense (DoD) submitted the Navy’s 2019 shipbuilding plan, which covers fiscal years 2019 to 2048, to the Congress in February 2018. The average annual cost of carrying out that plan over the next 30 years would be about $28.9 billion in 2018 dollars, CBO estimates. The Navy’s 2019 shipbuilding plan differs substantially from its 2017 plan in its goal for the total inventory of battle force ships, the number and types of ships that the Navy would purchase, and the funding proposed to implement the plan. If fully carried out, the shipbuilding plan would represent the largest naval buildup since the Reagan Administration in the 1980s. In testimony on April 12, 2018, two months after the Navy released its 2019 plan, senior Navy officials told the Congress that the Navy intends to extend the service life of all DDG-51 destroyers to 45 years, 5 to 10 years longer than indicated in the 2019 and earlier shipbuilding plans. It also expects to extend the life of up to 7 Los Angeles class submarines from 33 years to about 43 years. Together, the 2019 plan and the service life extensions would allow the Navy to reach a 355-ship fleet by 2034, although it would fall short of the specific goals for some types of ships that were identified in the Navy’s 2016 force structure assessment. As those developments illustrate, the size of the Navy does not depend on ship construction alone; the length of time that particular ships remain in the fleet also affects the force structure. The Navy estimates that buying the new ships specified in the 2019 plan would cost $631 billion (in 2018 dollars) over 30 years, or an average of $21.0 billion per year— $3.3 billion more per year than the Navy estimated new-ship construction would cost under its 2017 plan. Using its own models and assumptions, CBO estimates that those new ships would cost $801 billion (in 2018 dollars) over 30 years, or an average of $26.7 billion per year. CBO’s estimates are higher than the Navy’s because CBO and the Navy made different assumptions about the design and capabilities of some future ships, used different estimating methods, and treated growth in shipbuilding labor and materials costs differently. Much of the difference between the estimates stems from uncertainty about the design and capabilities of large ships being built 10 or 20 years from now—especially for two large shipbuilding programs in the 2030s and 2040s. That difference widens over time in part because the Navy’s method of developing constant-dollar estimates for most of its shipbuilding programs does not account for the faster growth in the costs of labor and materials in the shipbuilding industry than in the economy as a whole (see figure above). As a result, the Navy’s estimate does not reflect the increase in the real (inflation-adjusted) costs of ships with today’s capabilities that would be anticipated if such ships were purchased in the future. The Navy’s shipbuilding plan also reports only the costs of new-ship construction. It excludes other activities typically funded from the Navy’s budget account for ship construction that would, in CBO’s estimate, add $2.1 billion to the Navy’s average annual shipbuilding costs under the 2019 plan. Click here for the full report, on the CBO website.